If you use Gmail.com as your primary web mail client, you likely have noticed that Gmail has a new redesigned visual interface and appearance that is larger, more spacious, a bigger sidebar, and more bold appearance all around, with a series of new cursor hover detection features as well. Many Gmail users like the change and others may not notice the difference, while some others may feel the new visual interface of Gmail is not what they’re hoping for and would prefer something a bit more simple in appearance, or a faster version of Gmail. Thus some Gmail users may want to change Gmail back to the old classic version, or at least something that looks and feels closer to the older Gmail versions. We’ll show you a few different ways to change the Gmail interface and appearance, including switching back to Classic Gmail (though this may not be possible for everyone), some tips for adjusting the visual appearance of new Gmail to make it appear a bit more like the older version of Gmail, and even a method for how to use a much older simple version of Gmail that has a very simplified appearance without some of the newer features but in turn is lightning fast to load and interact with. Explore each of the options below to see how you can change Gmail. * The ability to use “Go back to classic Gmail” appears to be increasingly limited and appears to be in the process of being phased out entirely. 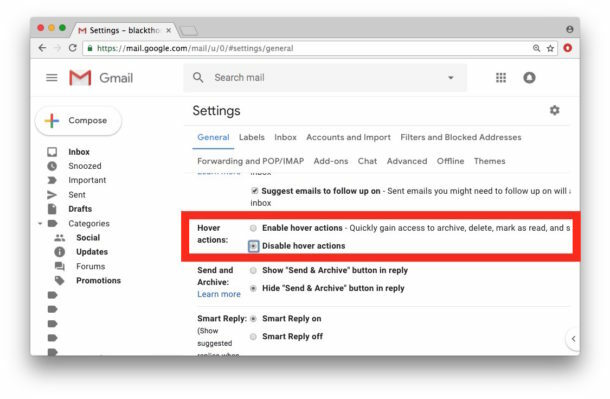 If you do not have the “Go back to classic Gmail” option then use the options below to adjust the appearance of Gmail, or much further below you can see the option to switch to Simple HTML Gmail. Those adjustments will change Gmail appearance and behavior a bit so that it functions closer to the prior Gmail release. 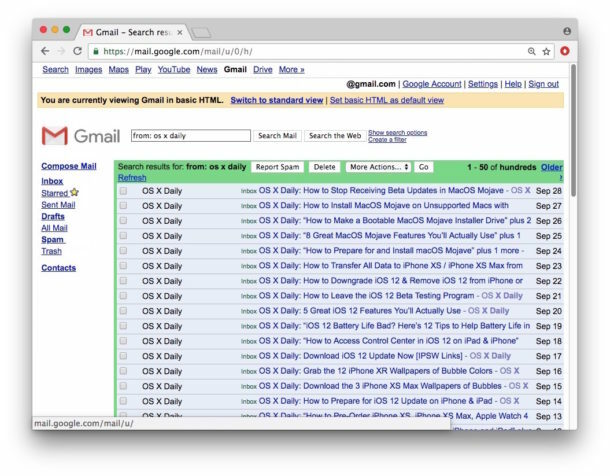 Increasing the visual density and disabling Hover Actions may be sufficient alone for many users who didn’t initially like the new Gmail, since adjusting those options allow you to see more emails immediately in a Gmail window while also preventing any of the Hover options from either obscuring email details or from being accidentally clicked. If you really don’t like the new Gmail interface and visual overhauls and behaviors, you can revert to what is basically a very old version of Gmail in appearance and functionality by using Simple HTML Gmail, which strips out all of the fancier features and any visual styling, making it look sort of like how Gmail did a decade ago. You’ll also see more emails per page since the Basic Old Gmail view is more condensed and has a much smaller sidebar and less bolding and padding. Using Basic HTML Gmail won’t be an option for all users if they want to continue using some of the fancier Gmail features like Hover, chat, keyboard shortcuts, and rich formatting, but if you’re mostly using Gmail as a simple email client and don’t need any bells and whistles it will work great. It also loads lightning fast, and has a very simple interface that is not intrusive even if Simple HTML Gmail may look a little dated to users who have accustomed themselves to the new Material Design appearance of new Gmail. I personally like Basic HTML Gmail, maybe it’s the sort of retro aspect to it, but that combined with the raw speed of the simple version works well for me. Which of the options above you’ll prefer, whether it’s simply adjusting thew new Gmail interface to show more emails per screen or changing the theme, or trying to go back to classic Gmail, or using Basic HTML Gmail, is going to be entirely a matter of personal preference and how you use Gmail. Your individual choices will likely depend on what size screen you use amongst other variables. Another helpful trick is to set the default Google account if you use multiple Gmail accounts, like many of us do for work and personal. Another very helpful Gmail trick for some users is to turn off Gmail inbox sorting and the labels for “Updates” “Promotions” “Social” and “Primary” which will instead place all emails into the same universal inbox view. Do you know of any other methods or approaches to changing the Gmail appearance back to the old version? Do you know of any other helpful tweaks or settings for Gmail to switch back to old Gmail, or to revert back to Classic Gmail? Share with us in the comments below! And you might also be interested in checking out other Gmail tips too. Whether or not you have the ‘switch to Classic Gmail’ option depends on whether or not you used it when the redesign notices first appeared… a lot of people probably ignored it because traditionally you’ve been able to switch away from new themes. This time at hte moment anyway the redesign theme is standard unless you previously switched. I suspect the new design is going to be default for everyone very soon if it isn’t already. Simple HTML mode is a suitable replacement but losing some of the features is disappointing. Aside from Protonmail which is paid service, Gmail is the best email for webmail. I have Outlook webmail too which is OK, MSFT is slowly catching up in many ways. Yep… I opened my gmail and it reloaded tonight (10/21/2018). With the new crappy look. A couple months ago, I could switch back to the old look using the gear icon. It seems they’ve done away with it entirely. Disabling “hover” helps A LOT. But it’s still not as good as the old style. Could you help us to get the spell checker back? When the revamp first appeared, I sent feedback about the wasted space, poor contrast, and lesser performance of the new design, then switched back. Since then, I’ve had the two week countdown warning twice on my account. I used the “Go back to classic Gmail” option after the first warning expired and it updated, but it disappeared and was no longer an option after the second enforced update. Even if it still appears in your account, don’t count on it sticking around. Switching back to basic HTML solves many issues, but why should users have to sacrifice functionality just for the sake of some contrast and more efficient use of space? The designers who create current UIs to look nice, but less functional will learn the lesson when they age and their vision deteriorates. It’s almost like contrast and readability is the last thing they consider. –the density – the new compact option is such a waste of space. These settings don’t seem to be persistent. As soon as I reload the page it reverts to the standard view despite settings being allegedly saved to allow the HTML view as default. I have the same problem. I can’t seem to get it to stay on the basic html setting. It looks like they are really trying to push the new interface. I have a relatively slow connection and I need the basic html version. That is incorrect, I am using Basic HTML Gmail right now. It is all I use because it is much faster to load and I sometimes have a slow internet connection and do not like the new cluttered interface of Gmail New. You can toggle it off or on in the corner of your Gmail window, or at the very bottom of Gmail screen. All that work on a new UI and you still cannot sort messages by sender. Grrr. that will show you only emails from that person in Gmail. Gmail being Google has HUGE array of search functions, it’s one of the best features of Gmail on the web. I use the search features in Gmail pretty often. Also I agree that the new Gmail appearance is too large too bold and too distracting, it’s a tight fit on a normal browser window and very tight on a laptop display, I hope they allow people to customize with a ‘classic’ theme. Until then I am also using Gmail Simple HTML version LOL! bibi, you seem to fail to understand the difference between _searching_ for messages from a certain sender and _sorting_ messages by sender. Chris complained about the lack of the latter, not the earlier. I.e. sometimes one wants to see all messages, but to see them sorted e.g. in the alphabetical order by sender name. THANK YOU! Just turning off hover actions and setting the display density to Compact made a huge difference for me. I’m not a huge fan of the overall redesign, but my main dislike was the extra padding in the spacing and the obnoxious animations whenever you moused over anything. I’m having a problem with my accounts loading up the page and then has to reload but won’t until signed in–even tho I’m already signed in. Just don’t understand why Google wants to force these changes on users. Many of us could care less about social tabs and the like. Many of us were quite happy with the look and functionality of the email GUI BEFORE this switch. I hate the new gmail redesign, even after these workarounds. It’s things like these that usually alert customers/people/investors that a company/stock has lost, or is beginning to lose, its ways. It’s a harbinger of (bad) things to come. Probably the talented employees (designers in this case) have left the place. Dumbed down GARBAGE designed for finger pointing halfwits on Tablets and Phones forced down the throats of Desktop users. It looks like it has been designed for a 5 year old, I refuse to ever use that garbage and will use HTML version professionally and Thunderbird for personal account, if need be I will switch to Mail.com or Yahoo, Yahoo webmail is great but they to have a box inviting users to click for a new version and guess what? – it is more dumbed down garbage in the same vein as the Gmail debacle. STOP dumbing down our Desktop services and making them look like Mobile versions!. Here are a few suggestions collated from various prior emails on this topic. I make not claims about whether these are good or bad. 2. Use Basic HTML version of Gmail to save yourself from eyestrain. 3. Switch to Compact view under ⚙Settings-> Display density to get the closest possible look of old Gmail classic and save yourself from eye strain. 5. Use https://chrome.google.com/webstore/detail/gmail-classic/flkjieldopkkipfldndimbfmlolahlfd . It is not perfect but not bad. 11. Politely use the feedback under settings. Just a little note on something mentioned in the first sentence of the article: the interface is described as having a bigger sidebar, and also as more spacious. The sidebar might be a hair wider (if that), but, of course, not any taller since (even on a full HD screen) it uses the full height of the browser. To describe something as more spacious means there is more space, when in reality, they just increased the space between labels, and there is actually LESS space now than before. I use a lot of labels in Gmail, and before, I was able to just barely see all of them in the sidebar; now, I have to scroll to see the last 5 of them. The little “handle” that lets you drag that area up or down is all the way down, yet there is still a gap of space before the Hangouts Contacts, Conversations, and Phone Calls icons at the bottom; there is an line above those icons, so why all the empty space above them but below the labels list? Surely they could code that section (if they wanted to) so that you could drag that handle all the way down? For me, being able to see less on the screen, and having to use more clicks to do things (why, oh why, Google, do you keep adding more clicks to do things in your apps and in Android….?) makes Gmail less useful than before. Why could they make the interface they’ve been using for the last few years as one of the themes (call it Classic or Pre-Material or something)? My issue is this: Gmail inconsistently places messages from Phys.org, as well as some of my personal correspondents, into the trash instead of the inbox. Under the older version of Gmail, I routinely checked the trash folder to see what Gmail had deposited in the trash, and moved whatever shouldn’t have gone there back to the inbox. Really, it’s bizarre. Google doesn’t *always* place newsfeed messages into the trash. It just *sometimes* places newsfeed messages into the trash. But in the latest configuration, trash view seems to be gone entirely. Whatever Google stuffs into trash is only recoverable if I set up a search. That’s considerably more trouble than just clicking my way to it, as I could do with the older Gmail versions. Worst of all, Google doesn’t learn from my corrections. If I routinely move correspondence from a particular sender back to the inbox, Google will still keep dropping messages from that sender into the trash. Now that it’s harder to even see what decisions Google has made, it’s majorly annoying. In the case of Phys.org, it’s silly to suggest adding it to my address book, since they’re no-reply messages. There’s no good reason to clutter up my address book with addresses to which I can’t even send messages. On my screen, there is a trash can icon on the left, below the drafts icon, which loads the trash view. I switched to the classical gmail, really like its compact look that shows more of the mail, a narrow tags column to choose from, but I was really annoyed by the imposing blue background that cannot be controlled and the lack of google talk plug in. Why not differentiate read versus unread mails with one colour uniformly bold instead of many bold fonts in black and blue ! There’s a chrome extension for that now. You can have Gmail Classic look & feel, while being on latest gmail. That’s great and all, but it can be a huge mistake to trust any browser extensions that are requesting or granted full access to read/write/modify web pages. A third party tool can modify, read, write, and access all of your web browsing…. Think about the implications of that, and what they could be doing. Many browser extensions are beyond shady and could be doing anything. Trust is more important than ever. What I like about the previous version of gmail is that I had it set to show important messages at the top and then the regular messages below; I could scroll down to glance over the other correspondence after looking at the items tagged important. Is there a way to get that back? I installed that “chrome extension” and it still looks like the NEW version. Doesn’t seem to work for me. Gosh, Google has really screwed the pooch here. Screwed up the nice thumbnail bookmark manager and now over complicated the email inbox interface. I mean seriously? You don’t need to re-design the wheel. If it works and is liked….leave it alone. Gosh I hate change just for the sake of change. Some google exec thought this new interface was better? Ridiculous. Hi Gertrude, I am not sure about your specific error but you might want to try using a different web browser. For example, you could try using Chrome or Firefox to access Gmail.com and see if it works. Both of those are free. Download one of those and then open the new web browser app, either one, then try logging into Gmail.com from there.